When one can print the text in a worship aid, the prayerful connection is easily made. However, when this is not the case, what purpose does it serve, and why persist in doing it? 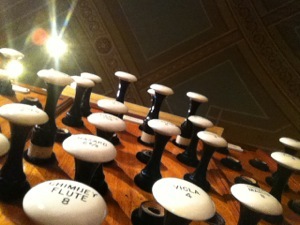 The answer is more closely related to the interior prayer life of the organist. Not only is a melody the subject of improvisation, but also the text must be in the heart of the improviser throughout! However, this applies to well-known sacred melodies that a listener would easily recognize. The most common example are masses sung in alternatum with the organ. It is clearly understood what the text is whether sung or played. But what about melodies that are unfamiliar, especially in a present-day context? Consider too, that the heart of improvisation is elaboration. Then what? Does anyone have any idea what we are doing? Is it important? Very few Offertory melodies are being whistled on the way out the door. In such cases, one would not argue that the organ is speaking the text in the sense of ”dicetur in organis” (it shall be said on the organ). Rather, the music must serve to the heart of prayer in of itself, as well as serve the ongoing liturgical action, which improvisation tends to do fairly well. CLOSE FRIEND, A PRIEST once told me years ago something I’ve never forgotten. “The people don’t need to know what it is to understand it.” In other words, they will understand the prayer interiorly if not in words. Since hearing that, I have always thought it important to play and pray music related to a relevant text. This is not an excuse for laziness and to not provide texts in worship aids. But in times when texts are not readily available, or even if they are, the liturgical understanding is not present, one relies on faith that what the musician prays edifies and transports those with open ears open to prayer. Another friend recently wrote to me, “I don’t think that the average Catholic has a conscious appreciation of our need for sacred mystery.” However, I believe that there might be a subconscious hunger for the sacred mysteries. While this may sound silly to some of us, it is worth the reminder to never be afraid of expressing mystery. Improvisation does this quite well as it unleashes the spirit. Coupled with Gregorian Chant, improvisation gives further voice to the sacred. Do not be afraid of the mystery! ERE I OFFER TWO somewhat random examples from the twenty-third Sunday in Ordinary Time. While crude videos, they were recorded during mass, hopefully retaining the continuity of the liturgical action. In somewhat of a colorful French, yet modal language, I hope my limited improvisational skills assist in prayer. Hopefully, if we make a habit of keeping the prayers of the propers in our hearts, we will ourselves become converted and transformed in the ways we most need. This in turn may assist in all the other work that we must do. There is power in improvisation and in prayer.